This post is sponsored by Go RVing. All opinions are my own. While we’ve traveled a lot we’d never had the pleasure of taking an RV trip through the Southwest. As excited as we were we knew it would be different than any other trip we’ve been on and might call for more preparation. Here are some things we learned planning and during on our trip that will be useful for other first time RVers. 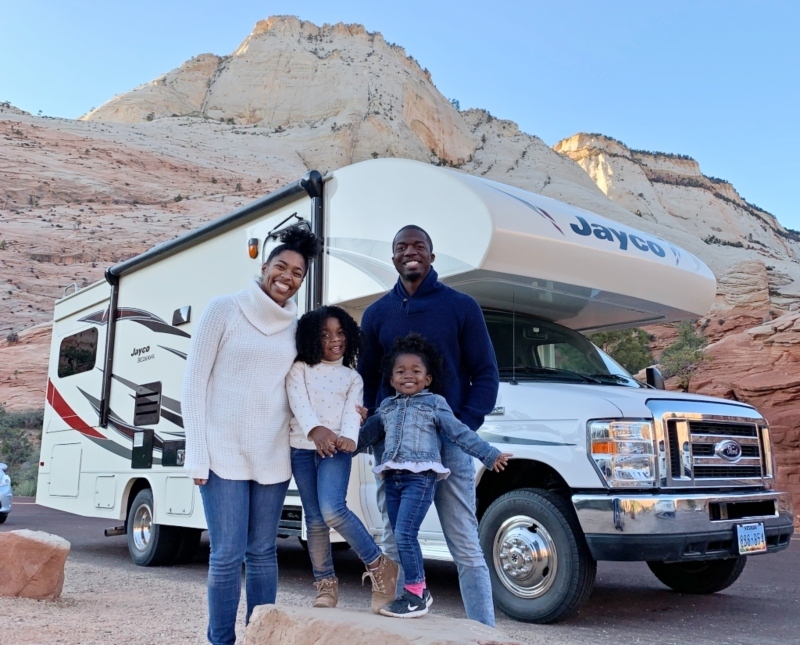 Did you know you could have an RV experience without owning an RV? Renting an RV is really simple! We rented ours from Outdoorsy, it’s like an Airbnb for RVs. The process was easy and the owner we rented from told us everything we needed to know before we drove off. We recorded what he said and showed so we could reference back on in case we forgot something on the road. There are three different types of RV: Class A, Class B, and Class C.
Class A RVs are the biggest ones and resemble coach buses. In all honesty they probably aren’t the best option for first timers unless you’re used to driving tour buses or tractor-trailers. Class B RVs are camper vans. They are sprinter vans that have been converted into a living space. This means the bathrooms and walking space is extremely tight. Your shower and toilet will be in the same space and the max sleeping capacity is typically two people. We rented a Class C RV. It is a motorhome on the chasse of a truck or a van. They provide a good amount of space and come with multiple beds, dining table and full bathroom. Here’s a glimpse of the one we rented but you check out more on what vacationing in an RV looks like. In addition to the motorhome RV’s there are also 5th wheel RVs. These are motorhomes that you pull with a truck and the home cannot be accessed from your vehicle. In most states RVs weighing under 26,000 pounds don’t require a special license. 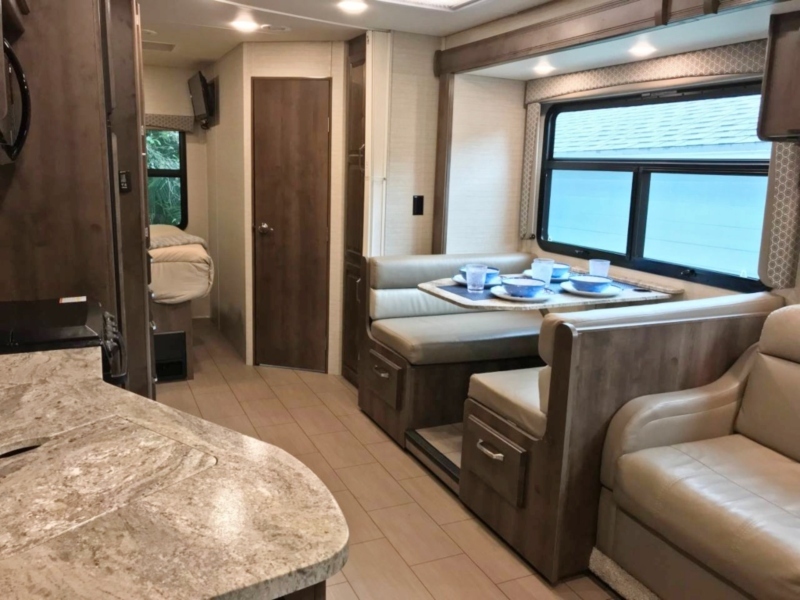 Be Class A RVs are the only ones that could potentially weigh more than 26,000 pounds so if you plan on driving a Class B or C RV you should be find. You can double check with the states DMV for updated information and these rules sometimes change. Making RV Camp Reservations: Do You Really Need To and What Type of Spot Should You Reserve? I am a big planner so naturally I wanted to make sure we had all of our RV camp reservations secured before getting on the road. Was this really necessary? I think it depends on when and where you are going. We traveled out West in late November when the weather starts to get very cold. 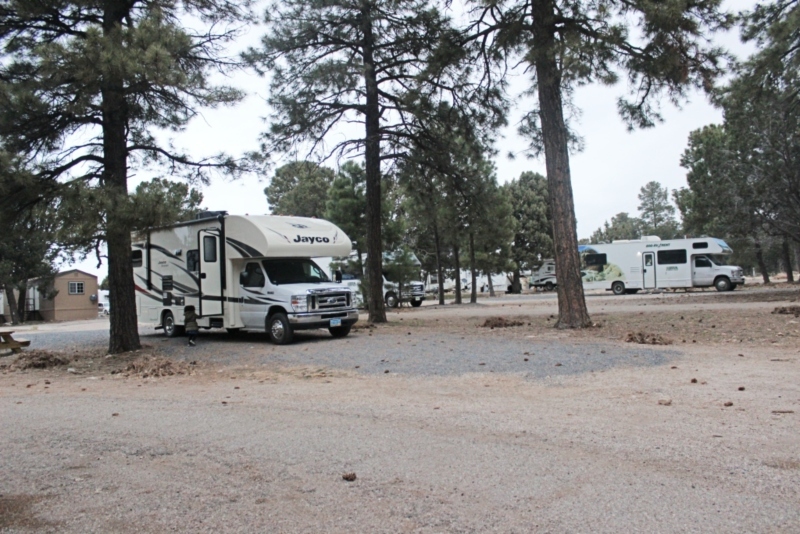 While the weather meant there were less RVers and making a reservation wasn’t really necessary to get a spot it also meant not all RV camps were open. When calling some closer to Bryce Canyon I discovered they were closed for the season. Had I not called ahead to make a reservation we could have been left in a situation of having spotty cell phone service making it difficult to find another RV camp to stay at. The nearest one open one was actually 90 minutes away so I’m really happy we planned ahead. Some RV parks have different hook up options. When booking your RV Park you need to know if your RV is 30 or 50amp to make sure you book the correct spot. 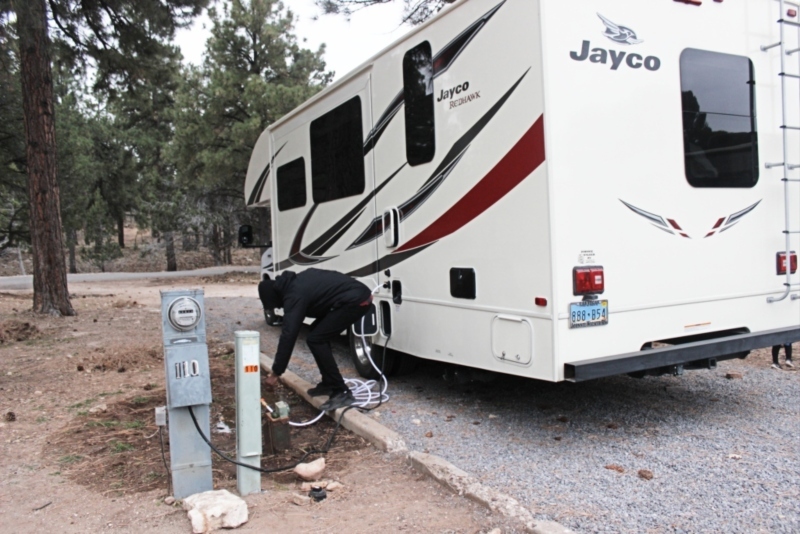 Some RVs do come with an adaptor to hook up to either but many don’t so make sure ahead of time if you’ll need one or not. Depending on the RV you have your stove and central air including the heat may run on propane only. This means even if you are hooked up to electricity without propane you will not be able to cook or stay warm in the winter. 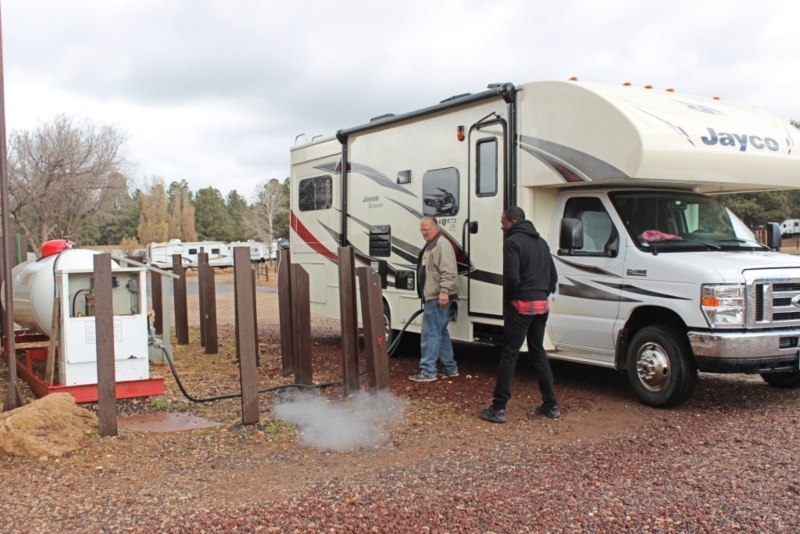 Filling up the propane in an RV can only be done by a professional and not all propane refill stations service RVs. It’s imperative you know where you can fill up alone your route or you could be hungry or freezing! If you’re not pulling a fifth and have a true motor like us parking can be a little tough in some locations. Make sure each of your destinations has parking for RVs. Even if they do space might be limited so always give yourself extra time to find parking in case you have to go to a different RV parking lot. These tips should help make your first RV trip one without many hiccups. One thing we learned was the RV community is very helpful. When in doubt just ask a fellow RVer and they will gladly assist you. Enjoy your first RV trip and good luck with not wanting to immediately purchase one when you get back home! This trip was in partnership withGo RVing. All opinions are my own and true! Monet!! This is so awesome! One of my most memorable vacations was (summer of 4th grade) the year I took a road trip with my grandparents visiting over 7 states! I have YET to convince my husband and teenage children that this is an experience they need in their lives… but your post may help. Thanks for sharing your adventures.